Australian travel distribution company, Helloworld, shares how implementing a new social management tool can help optimise sales and drive customer engagement, while effectively improving productivity. The proliferation of social media channels has generated complex challenges for organisations serious about staying competitive and efficient, while keeping customers engaged in real time. Similar to all companies who manage social media channels, Helloworld was faced with finding creative content that was inspiring while responding to the growing number of messages coming through different social media platforms. With a growing fan base across Facebook, Twitter, Instagram and Google+, staying on top of content creation and management was becoming increasingly complex and time consuming. When Nadan started her role at Helloworld, the company was using an agency to manage social media, which was focused mainly on content creation rather than customer service. “We need to find a way to be faster and more effective with our customer service and engagement strategy,” she said. At the same time, Nadan said the company didn’t have tools to publish on multiple social media channels simultaneously, making it necessary to post natively on each channel. On top of this, without a sophisticated data analytics tool, Nadan found it was difficult to know which posts were working and which deals would be most effective for Helloworld’s global customer base. To cope with these growing social media management concerns, Helloworld implemented Oracle Social Cloud. Improving community management and customer service have been particularly important for the brand’s social media strategy, Nadan continued, and there are a few teams now using the Social Cloud tool. “There is a function that lets you assign messages that come into your social feed like questions and feedback, which means I can flag them and assign them to the correct teams,” she said. “Being a relatively new brand, the thing we wanted to show that set us apart was that we were experts in travel and to be able to give expert advice. So in order to fulfil that mission, we have to be timely. As a result, Helloworld has been able to grow its fan base to over 185,000, develop a more targeted and engaging content strategy, improve its response rate and deliver more targeted and successful promotional campaigns on social media. And with more than 300 franchised travel agents, Helloworld now also uses its social media channels more effectively to generate sales leads and to provide support to customers. “We’re a very lean team, so having a solution that integrates analytics and automation is a lot more efficient and streamlined than what it used to be,” Helloworld’s consumer marketing manager, Rebecca Hurley, said. The company’s recent strategic move has already proved successful, helping Helloworld improve its customer service and respond to 3500 customer messages each month in only 45 minutes through mobile devices and computers. The company also uses social listening to determine what customers like to build more engaging content to generate sales leads instead of relying on advertising and promotion. 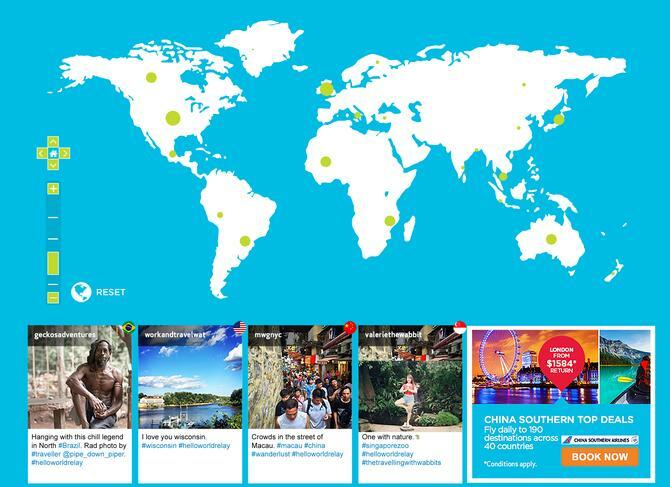 The #helloworldRelay social media initiative chalked up more than 10,000 enquiries from customers over a seven-day sales period. Partnering with over 60 countries and 80 lead Instagrammers, the activity was based around an Instagram relay that captured and showcased countries, cities, people and places through images on World Tourism Day (27 September). In addition, more than 360,000 engagements took place across its social channels. Helloworld was also recently recognised for its social media strategy and campaign in the 2016 CommsCon Australia and the Festival of Media in Asia-Pacific, where it was shortlisted for major industry awards. - This article originally appeared in CMO magazine, Issue 1, 2016. To sign up for your print or digital copy, click here.